Is student loan debt holding you back from being a homeowner? Many first time buyers are worried that their large student debt takes them out of the game when buying a home. But, most of the time, it doesn’t! So, don’t automatically assume you’re facing a roadblock to homeownership if you have student loan debt, most everyone does, even people who have bought a home! There are ways to work with lenders and assistance programs to make your first home purchase a reality — and even more affordable despite your student loans. The “You’ve Earned It” program in Maryland is one we’ll highlight below. We understand that you may be grappling about whether you should pay off your student loan debt first before you even purchase a home. That could be an option but don’t make it your only one. We’ve got some other options for you to consider so you don’t have to delay years until becoming a homeowner, especially if you have substantial student loans. And always remember to please consult with your own financial advisor to determine what is best for your situation. Let’s get to the basics first. When you buy a home, a lender will look at your debt-to-income ratio or DTI. It’s the amount of recurring debt you have monthly compared to your gross monthly income. In a lender’s eyes, your DIT is more important than your credit score or how much money you have for a down payment. A lender needs to consider your recurring debt — such as a car loan, credit card payments AND your student loan(s) — in order to determine if you can afford more debt with a monthly mortgage payment. However, most lenders like to stick to the 28/36 rule. And that’s where the 36% DTI from above comes into play. The 36% is the back-end ratio and equals your entire monthly housing costs expenses (principal, interest, mortgage insurance, property taxes) plus other debts (student loan, car loan, credit cards, etc) divided by your gross monthly income. It’s the DTI we explained above, and you don’t want to go above 36%. The 28% is part of the front-end ratio equals your monthly housing expenses (principal, interest, mortgage insurance, property taxes) divided by your gross monthly income. Your other recurring debt is not included. Again, a lender doesn’t want to see it above 28%. And that’s why it can be frustrating for many first-time buyers with student loan debt who have good credit scores. If you need to lower your monthly debt and obligations, start with your student loan lender(s). Here are some options to consider. Remember to always consult with your own financial advisor before pursuing. Graduated repayment plan – payments start low and rise every two years as your income should rise. Loan consolidation – if you have more than one student loan, combine them into one with a lower interest rate. Lengthen your payback term – spread out your loan repayment over more years to lower your monthly obligation. This will increase you long-term interest payments so carefully way the pros and cons of this strategy. Consider bumping up your monthly income with a side job … every little bit could help your cash flow and savings. Don’t buy a car and use public transit to eliminate a recurring car loan debt. See if you can negotiate a lower minimum monthly repayment requirement on your credit cards, especially one that is on the higher side. Some credit card companies are willing to work with you if you have a good credit score and payment history. When you have student loan debt, you need to find a mortgage lender who is willing to work with you and offer programs that may be geared toward borrowers just like you. Steer clear of lenders whose underwriters just look at your entire balance of student loan debt and not your current monthly payments compared to your income. You will likely not qualify for a mortgage loan with them. It won’t matter to them if you have lowered your monthly payments with a graduated repayment plan – they will calculate your DTI by using the percentage of your total loan balance. Many lenders work with state and federal assistance programs, and may have a better track record when dealing with first-time buyers with student debt. Your college or graduate degree is worth something and it should continue to advance your career and your earnings. These programs below will help jump start your ability to make home ownership a reality. In 2018 the Federal Housing Finance Agency raised the conforming loan limits to a maximum of $679,650 in high-cost areas such as the DC metro area. Now it can be easier for many buyers to qualify for conforming loans backed by Freddie Mac and Fannie Mae. This means many buyers won’t need to qualify for a jumbo loan, which requires a larger down payment. This is good news for those of you with student loan debt and constrained cash flow. The state of Maryland is making an effort to help potential homebuyers who have student loan debt. They’ve launched two specific programs within its Maryland Mortgage Program (MMP). You’ve Earned It Program –This Maryland program gives a little bit more help to those first-time buyers who qualify for a MMP loan and also have a minimum of $25,000 in student loan debt (whether it’s in repayment or deferred status). You must complete homebuyer education. You must use an approved lender. Condo buyers will need to purchase in a FHA or Fannie Mae-approved building. Also available with the You’ve Earned It program — The Partner Match Program and the Maryland Homecredit Program. Check out mmp.maryland.gov/EarnedIt for more information. SmartBuy Program — This Maryland program is different since it’s focused on specific and limited number of eligible properties that have been selected by the Department Real Estate Owned (REO). There’s not as much flexibility and a limited choice selecting of a home, but could be an option for some buyers. This program will pay off any outstanding balance on a borrower’s student loan at the time of the home purchase with certain restrictions. You must have a minimum of $1,000 student loan debt and up to a maximum of 15% of the home’s purchase price. First mortgage will finance up to 95% of the sales price. A second mortgage will be a forgivable loan to pay off the student loan balance. A third mortgage can be in the form of a down payment assistance 0% deferred loan. You must live in the house for at least 5 years to have your student debt forgiven. There are several government programs that offer loans to borrowers with student loans. Each has different requirements and may not be a good option for you. However, one may make your homeownership dreams comes true. Fannie Mae HomeReady Mortgage — allows up to a 50% DTI and 3% down payment. VA Loan Guaranty – Buyers who have served in the military can qualify for a loan with 41% DTI. That can be overridden if some of your income tax free. FHA Loan – Usually allows a 43% DTI but will sometime allow a higher DTI on case-by-case basis. The state of Virginia doesn’t have a specific program geared toward student loan debt like Maryland. However, there are some local and state assistance programs that can make home-buying more affordable for first-time buyers, many of whom have student loan debt. Contact us for a complete list of these programs, including grants from the Virginia Housing Development Authority for down payment and closing cost assistance. Evaluate if you’re truly ready to be a homeowner even though you have student loans to pay back. Homeownership is both a big financial and lifestyle commitment. 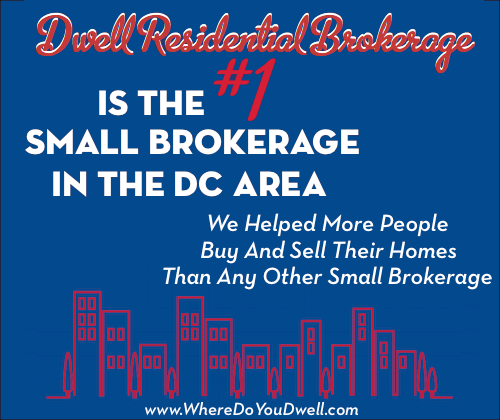 You may already be handling sizeable monthly housing costs because of the higher rents in the DC metro area. You may be ready to invest that money in your own home and not a rental. Honestly answer questions about yourself. Do you have a good job with steady income with expectations of more earning power? Do you plan to remain in the area for the next 5 years minimum? Have you been paying back your student loans each month and have some money saved? Is your DTI not too high and you’re willing to find an assistance program that could help? As a first-time buyer with student debt, you may need to lower your expectations for your first home, maybe change locations or buy a townhome instead of a single-family house. Focus on getting your first home and clear that hurdle. If you do it right the first time and aren’t house poor, you’ll be able to move up to your next home in later years. You invested in your education and it took time to get your degree and start your career. It’s almost the same with becoming a homeowner. It takes time but your first home can lead to your next and so on as you get more financially secure. Questions? We are here to help you determine if homeownership is right for you now or in the near future. It does take some planning even if you don’t have student loans, so give us a call and we can come up with a plan based on your timeframe. So, don’t let student loan slow your home buying dreams come true. 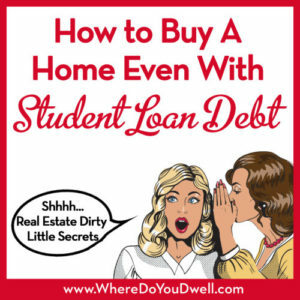 In fact, we’ve had many clients end up paying off their student loans in FULL with the equity they received from their first home purchase, so actually, buying a home could possibly help you pay off your student loans even more quickly! No grantees, but we’ve known many people to have that experience, including our own student debt!